Elliot's mum is ill and his home is under threat, but a shooting star crashes to earth and changes his life forever. The star is Virgo - a young Zodiac goddess on a mission. But the pair accidentally release Thanatos, a wicked death daemon imprisoned beneath Stonehenge, and must then turn to the old Olympian gods for help. After centuries of cushy retirement on earth, are Zeus and his crew up to the task of saving the world - and solving Elliot's problems too? No ending - waiting for next book ARRRGGHHHH!! 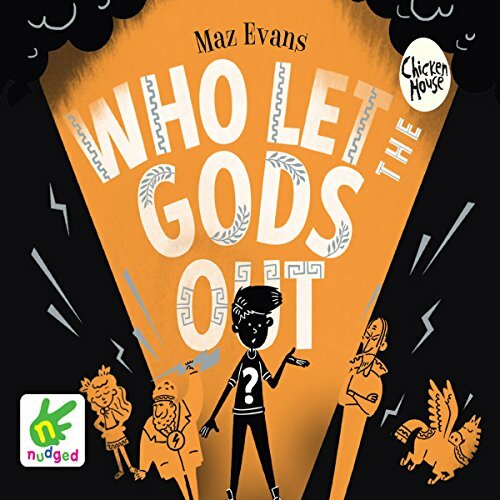 What did you like best about Who Let The Gods Out?? What did you like least? Would you recommend Who Let The Gods Out? to your friends? Why or why not? Listened to while thing I one day. Loved every minute, great story and love it when authors read their own work, can't wait to get started on the next one. Love the idea of Gods experiencing the modern world! Both my children enjoyed this story, aged 8 & 11. Looking forward to the rest of the series! I have already read this 3 times. The narration is great - I love all of the different voices! Loved it - so funny! This was so much fun to listen to. I'm in my 30s and loved it! I love the fact that the author is also the narrator as all the characters are portrayed exactly as she envisioned them. I've always enjoyed Greek myths, and I think this (along with Percy Jackson, sorry, I can't help making a comparison), is a perfect introduction to those stories. This is definitely funnier than Percy though. Excellent story, and narration. I've ordered all the books in the series now, and hope to get them all listened to by the time the final installment is released. I can't wait to find out what happens! I was a bit concerned to start with as there are some quite upsetting moments early on. Our hero's mother obviously has early onset Alzheimer’s (forgetfulness, confusion) and Eliot is her carer. My two boys (aged 9 and 11) were quite upset when Eliot's Mum was crumbling, and as such I would not recommend this book for young children. Once the mad-cap action started though, we were away. I thought I'd find it a bit samey as we've already done a few of these mythical-hero-mixed-with-real-life stories (Percy Jackson etc) but there's enough differences here to make it feel fresh.